The 2018 Jeep Wrangler JL is the successor to the wildly successful Wrangler JK – a vehicle that lasted from 2007 until the early parts of 2018. 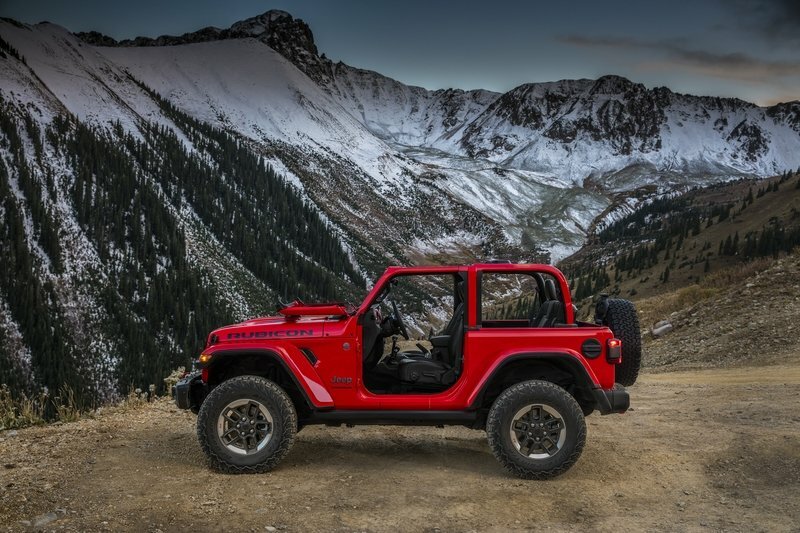 The new Wrangler JL picks up where the JK left off by offering an open-air driving experience on both paved roads and where no roads exist. The Wrangler continues to stay true to the Jeep legacy of all-terrain travel while offering more creature comforts and the least-compromised on-road driving experience of any vehicle in the lineage of the Willy MB from 1941. For 2018, the Wrangler’s appearance is an evolved take on the previous JK, adding in better aerodynamics, more roof options, and improved safety, especially in the rollover department. New details bring the JL into modern times. Things like LED headlights, fender-mounted daytime running lights, and an interior that doesn’t look made by Little Tikes. New powertrain options bring more power and added fuel efficiency, while a manual transmission and manually operated transfer case keep ties to the Jeep heritage alive. 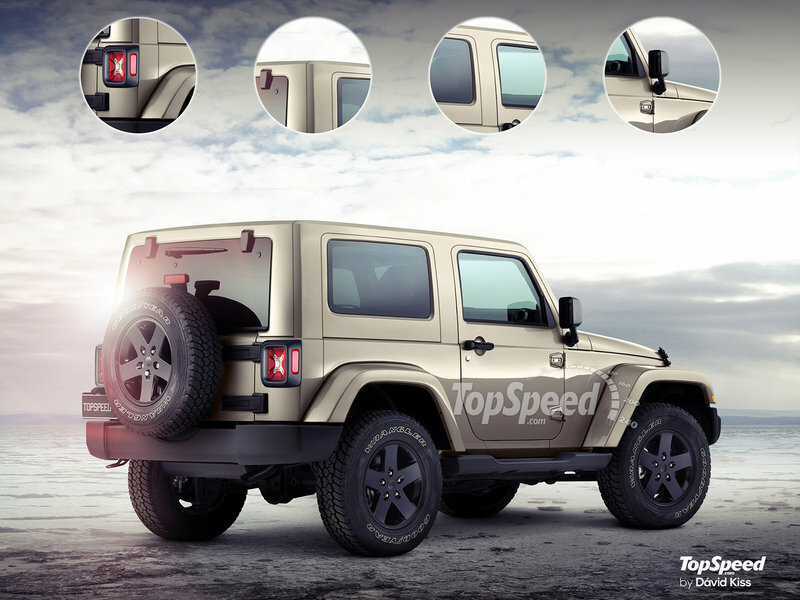 Update 11/01/2017: Jeep has released photos of the 2018 Jeep Wrangler JL amid the SEMA Show and ahead of the Wrangler’s full debut at the L.A. Auto Show on November 29. The 2018 Jeep Wrangler JL builds on what the Wrangler JK established. The overall look isn’t much different, though, on closer inspection, every single body panel is completely new. Up front, the JL has a new bumper design with repositioned fog lights and chrome accents. The iconic seven-slotted grille now has a kink towards the top and the headlights are now LED, at least in the upper trim levels. The fenders how house LED daytime running lights and turn signals. The hood has vents for heat extraction, as do the front fenders. The doors are easily removable, the windshield now has an easier procedure for folding flat, and Jeep now has more roof options. The windshield is now more raked, helping with aerodynamics. The doors have a deep character line running under the windows. Around back, new taillight designs with LED bulbs bring an updated feel to the Wrangler. A backup camera is positioned within the center hub of the spare tire and the third brake light still resides on an arm mounted behind the spare tire. Thankfully, all the removable body panels carry over on the 2018 Wrangler. The doors are easily removable, the windshield now has an easier procedure for folding flat, and Jeep now has more roof options. The three-piece freedom top returns, as does the full soft top. New is the power-retractable hard top that basically has a large center section that retracts rearward, much like a large panoramic moonroof. Under the tops lie upgraded roll bars. These are more integrated into the structure of the Jeep, giving passengers a safer ride. New for the Wrangler are solid A-pillar supports. This makes the windshield a non-structural piece and therefore easier to fold flat. The A-pillar supports keep passengers safe, even with the windshield folded. The roll bars also have body-colored panels mounted to the outside. 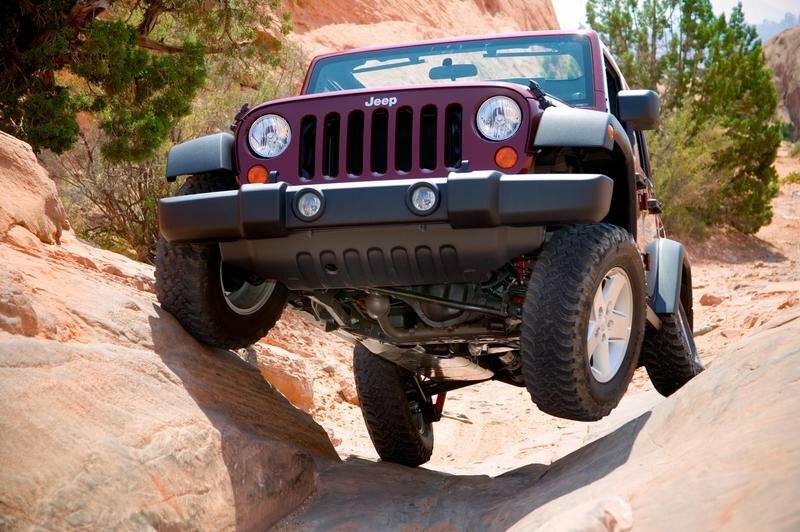 It was in 2007 Jeep launched the Wrangler JK that’s currently in showrooms. The JK was a revolution thanks to its available four-door body style called the Unlimited. This boosted Wrangler sales since families could justify the Jeep for more than just weekend trail rides. Now, the vast majority of Wrangler JKs are of the four-door variety. Both two- and four-door versions will continue into 2018. That continues into 2018 with the Wrangler JL; both two- and four-door versions are offered. Both body styles will retain the same design; only the wheelbase length and door count will be different. Inside, the rear passengers will get more legroom and have an easier time getting in thanks to the Unlimited’s rear doors. Two-door Wranglers will continue using a folding and sliding front seat pedestal that allows for egress into the second row. Jeep is starting 2018 off slowly with only three trim levels. There is the base Sport, the luxury-minded Sahara, and the ultimate off-roader, the Rubicon. Initial sales will only be of the four-door Unlimited model, but the two-door Wrangler will follow early into 2018. The Wrangler-based pickup, rumored to wear the iconic Scrambler name, will debut for 2019. The 2018 Wrangler has an all-new interior, and boy, it needed one. The outgoing JK suffered from cheap plastics and severely outdated in-dash electronics. 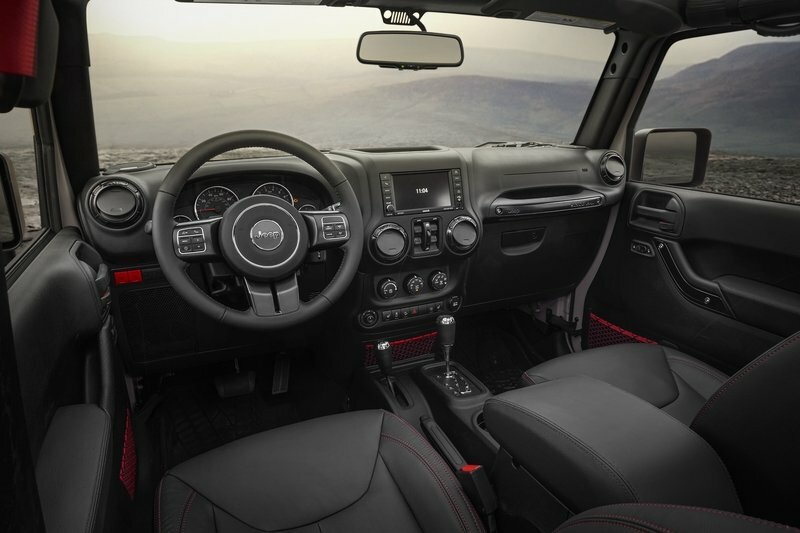 Now with the JL, the Wrangler offers FCA’s current Uconnect infotainment system in three sizes, a digital driver information screen within the gauge cluster in two sizes, and an overall air of quality. Adding to the Wrangler’s functionality are auxiliary switches that customers can tie their aftermarket products to. For example, off-road light or an air compressor can be wired to one of the four auxiliary switches, making the installation both easier and keeping the Wrangler’s interior free of ugly aftermarket switch panels. Creature comforts include dual-zone climate controls, heated front seats, a heated steering wheel, and upgraded steering wheel controls. Creature comforts include dual-zone climate controls, heated front seats, a heated steering wheel, and upgraded steering wheel controls. As for those screen sizes, the base driver’s information screen is 3.5 inches and the upgraded screen is 7.0 inches. On the infotainment front, the base Uconnect screen measures 5.0 inches, the mid-level screen is 7.0 inches, and the one you want is the lovely 8.4-inch screen. The Rubicon will have its electronically disconnecting front sway bar and locking differentials return, as well. The sway bar is controlled by a button beside the auxiliary switches and locking differentials are activated by a toggle switch – all of which are placed low on the center stack. Until Jeep releases interior photos check out the interior images from the leaked owners manual. The 2018 Jeep Wrangler JL has three engine options. 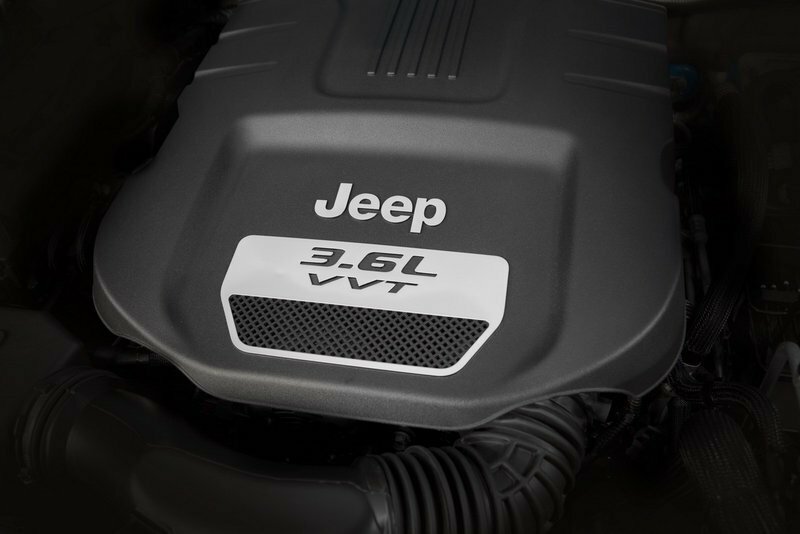 The 2018 Jeep Wrangler JL has three engine options. The first is an updated version of the familiar 3.6-liter Pentastar V-6. The newcomer is a turbocharged 2.0-liter four-cylinder known as the Hurricane. And finally, Jeep is giving the Wrangler the 3.0-liter EcoDiesel V-6 found in the Grand Cherokee (and also the Ram 1500 pickup). Transmission choices include the ZF eight-speed automatic and a six-speed manual transmission. Jeep has yet to confirm what engine and transmission pairings are possible, though we know the Pentastar will be available with both gearboxes. As for power, we are hoping for at least 300 horsepower and 270 pound-feet of torque from the Pentastar V-6. The 2.0-liter turbo-four was rumored to have 368 horsepower, though that has been downplayed by FCA. We expect the EcoDiesel V-6 to continue making 240 horsepower and 420 pound-feet of torque.
. Both transfer cases allow for rear-wheel drive, neutral, 4WD high-range, and 4WD low-range. The full-time 4WD system also has the option of an automatic mode that detects wheel slip and sends power to the front axle when needed and without driver intervention. Rubicon models come with locking front and rear differentials and the electronically disconnecting front sway bar. Rumors had been swirling that Jeep would move the Wrangler to a four-wheel independent suspension system, but we know the Wrangler sticks to solid front and rear axles. For true Jeep enthusiasts, that’s a great thing. This means the traditional Dana axles are present, as well as the multi-link and coil spring suspension system. This will allow for plenty of wheel articulation in off-road environments, especially for Rubicon models with the front sway bar disconnect. The aftermarket will also be able to offer more suspension lift and upgrade options for Jeep owners who want more capability. The trade-off is a slightly less refined ride on the road, with truck-like cornering abilities. Still, those who truly want the Jeep lifestyle are generally happy to make the on-road sacrifices. The Wrangler’s frame is a fully boxed design. This, combined with the stronger roof section, will mean a much more rigid body structure. Jeep is undoubtedly becoming more proud of its hot-selling Wrangler. With sales continuing to grow like weeds in summertime, the automaker will likely increase the entry price for 2018. Sadly this means the Jeep will move slightly upmarket and be harder to justify for those wanting a bare-bones off-road vehicle they can abuse on the weekends. Currently, the 2017 two-door Wrangler carries a starting price around $23,800. For that you get crank windows, no air conditioning, and a manual transmission. Opting for the four-door Unlimited bumps the price to $27,60. For those wanting it all, the range-topping Rubicon Hard Rock with all the bells and whistles added tips the scales at $48,000. The Wrangler JL will likely carry a base price of $24,000. The Unlimited will probably start at $32,000. Max prices with all the options added will likely break the $50,000 barrier. 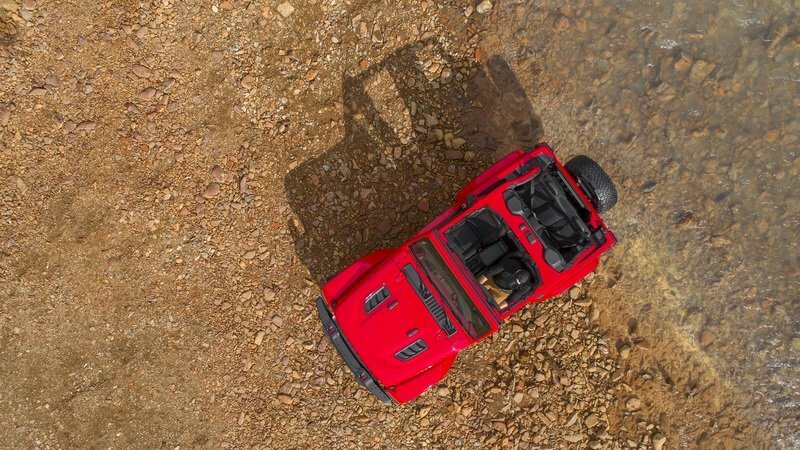 Ford’s resurrection of the Ford Bronco leaves off-roading fans hot under the collar for a hard-core Wrangler competitor. It’s still unknown what direction Ford is taking the new Bronco, but we’re hoping for a rugged SUV with real capabilities. This would mean the Wrangler would have more competition than it currently does. The Bronco would come with EcoBoost power, an honest 4WD system, and an independent suspension system. The Bronco will most likely be better mannered on the highway, but will still give the Jeep a run for its money. 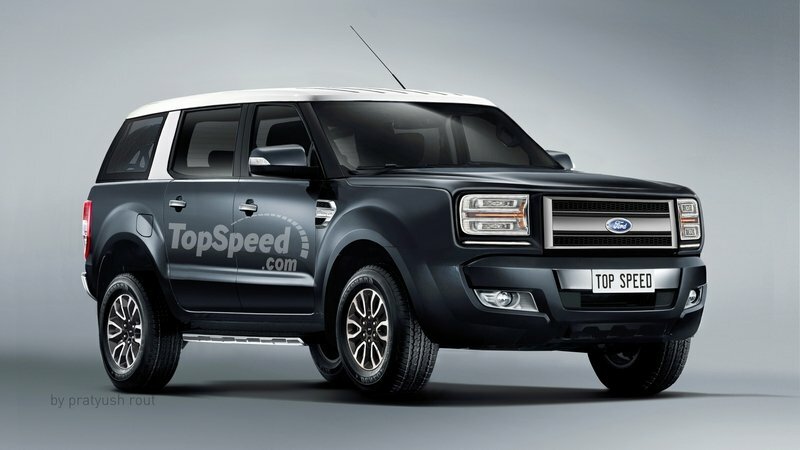 It’s doubtful, but Ford could offer the Bronco in both two- and four-door versions to compete with both versions of the Wrangler. It’s easy to imagine Ford bean counters and product planners drooling over the Wrangler’s recent success and sales growth, so they might actually let their engineering counterparts build a respectable hard-core SUV with few compromises. Only time will tell, however. The next-generation Jeep Wrangler has huge shoes to fill. The outgoing Wrangler JK has far exceeded anything the previous Wrangler and CJ models ever accomplished sales wise, while still holding true to that iconic Jeep image. The new model must be safer, more economical, and more technologically advanced, yet still act like a 50-year-old vehicle in the mud. Thankfully, it seems Jeep has accomplished this. We’re really looking forward to seeing the full details on November 29, 2017, at the L.A. Auto Show. Stick around for that. The Jeep Wrangler has been an icon of American independence since 1941 when the U.S. Government sought a small, go-anywhere vehicle that could support troops heading into battle. It was the Willys Overland company whose design won. With the help of the Ford Motor Company, more than 600,000 MB Jeeps were built. After the war, Willys tried marketing the MB as a replacement for the farm tractor. Its name was changed to the CJ, or Civilian Jeep. Fortunately for Willys, people saw the CJ as more than just a glorified tool. Corporate ownership changes saw the Jeep brand move from Willys to Kaiser to AMC to Chrysler, and finally to Fiat Chrysler Automobiles. Despite the changes, the Jeep brand stayed strong. Various versions of the CJ came along, then the Wrangler YJ debuted for 1986. The Wrangler TJ came in 1997 and finally, the Wrangler JK came in 2007. The JK can take credit for transforming the Wrangler from a two-door toy to a four-door family SUV with the 2007 Wrangler Unlimited. It quickly became the best-selling version and will continue leading sales with the new Wrangler JL. Update 6/23/2017: A two-door prototype of the upcoming JL Jeep Wrangler was spotted in an undisclosed parking lot this week. Check out our spy shots section below to get your first look at the upcoming JL and to learn a little more about it. 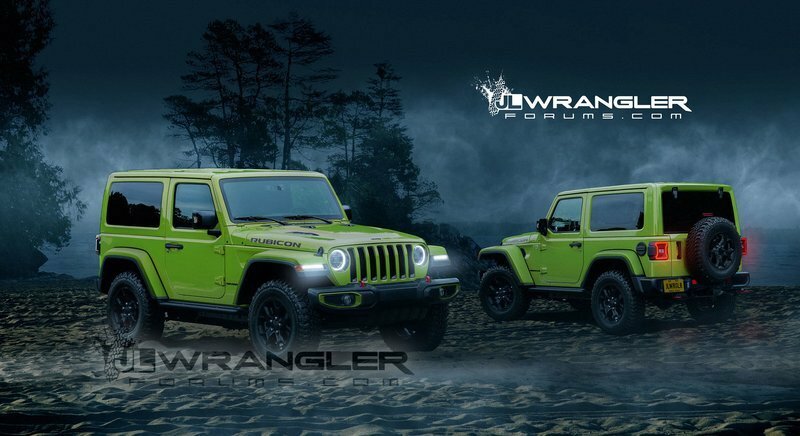 Update 05/20/2016: Speculation from a Wrangler forum suggests three separate roof types and a turbocharged four-cylinder. The details are outlined in special sections below.